The Dowagiac River is a stream in the Lower Peninsula of the U.S. state of Michigan. It flows into the The stream rises as the "Dowagiac Drain" in central Decatur Township in southern Van Buren County, Michigan. It is joined first by the "Red Run" and then by the "Lake of the Woods Drain" near the southern edge of Hamilton Township, it becomes the "Dowagiac River" before entering into Wayne Township in Cass County. North of the city of Dowagiac, the river passes through the "Dowagiac Swamp". Just west of Dowagiac, the river is joined by its principal tributary, the "Dowagiac Creek". The river continues south and west into Berrien County, where it flows into the Street Joseph River just north of Niles. 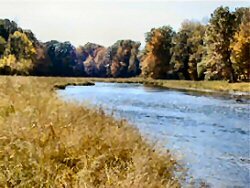 The Dowagiac River is a moderately paced stream. Shaded by overhanging hardwood trees for much of its length, the river flows at a generally relaxed pace. The stream is not a good choice for overnight trips, as much of the shoreline is privately owned. However it a good option for families looking few hours of paddling.